Today we continue our country profile interview series, this time chatting with Dave Corley about OpenStreetMap in Ireland. Things have come a long way since SotM 2008 was held in Limerick (as an aside, I’m proud to say I was a speaker and OpenCage’s sister brand, Nestoria, was a sponsor). My name is Dave Corley and I work in the medical device industry, so for me, OpenStreetMap is a hobby. I got into OpenStreetMap at the beginning of 2012 when I finally picked up a phone with GPS and started recording some gpx tracks. On my first try, I went through a lot of frustration trying to figure out what I was doing, and how everything worked. I communicated some of these frustrations on a local message board here in Ireland and a local mapper responded by asking me to join the OSM Ireland chatroom. If it wasn’t for the initial help I received, it’s likely that I wouldn’t have lasted more than a day whereas now I am closing in on 1.5 million edits and have met many fantastic people though OSM here in Ireland and even attended the 2013 SotM in Birmingham. 2. What would you say is the current state of OSM and the OSM community in Ireland? To answer the first part, OSM in Ireland has come on in leaps and bounds since the introduction of Bing imagery, without it, we would likely be at 30% of where we are now, if not even lower. Almost all of the data for Ireland has been edited by armchair mappers by necessity. There is simply too much to do to be able to ground survey everything, one example, in my county there are over 6,000 km’s of road, I could never drive all of those so I make use of Bing to map them all instead. We also rely heavily on out-of-copyright maps and have had some important donations of maps from the National Library of Scotland and from Trinity College Dublin. The OSM community in Ireland are a great bunch of folks and driven by one of our community, we finally got around to having meetups on a regular basis this year. We don’t have any official kind of organisation but we recently discussed forming an official body with a view to becoming a recognised local chapter and I’m pleased to say everyone had a positive attitude to the idea so we should start progressing in this area very soon. Up to this point though, something like that has not held us back and we have some extremely talented people of all ages as part of community. We are lucky enough to host our own versions of Nominatim, Overpass & Overpass Turbo, Taginfo and our own maps at http://maps.openstreetmap.ie as well as a hosting all our out of copyright maps at http://maps.openstreetmap.ie/oocmaps.html. We actually find ourselves limited by the current server as there are many more tools we want to host Irish versions of. 3. 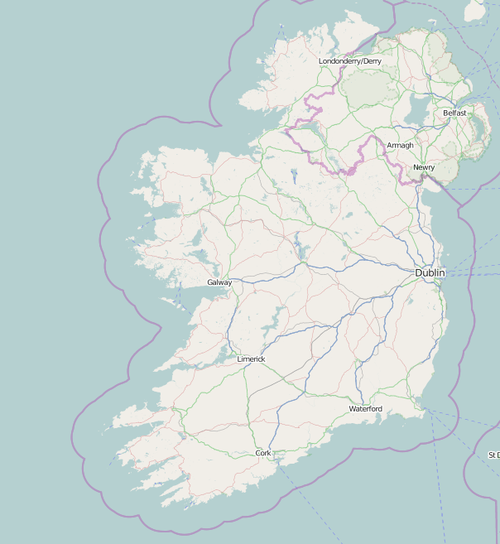 What are the unique challenges and pleasures of OpenStreetMap in Ireland? What aspects of the projects in Ireland should the rest of the world be aware of? In terms of challenges, one of the biggest is in terms of language and naming in rural areas and to a lesser extent in urban areas. It is not unusual to come across signs for the same area spelt differently. I’ve seen incidences where these signs sit on top of each other and there are only so many alt_name’s you can have before it becomes difficult to manage, especially in terms of map labeling i.e. which sign is correct. Recently a government funded website logainm.ie, which provides the official Irish translation for all English place names, has adopted the ODbL licence for their data so we now have a source to base our Irish language naming on. One of the biggest pleasures of OpenStreetMap in Ireland, for me personally, is getting out to see areas I would otherwise never travel to. The city I grew up for example, I have walked, cycled or driven every little street and alleyway. One of the biggest drivers for me is address mapping which means I’ve also gone into every housing estate that I come across which has resulted in finding many more POI’s than would otherwise be possible. The biggest project we are currently working one as a community is townland mapping. Townlands are the base administrative land unit upon which all others are based here so we are working hard to get these mapped. They also represent the basis of addressing for all of Irelands rural population. We are currently using the Trinity College Dublin donated maps to trace all the townlands in Ireland which, when complete, will be the only copy of this important set of geo data available under an open licence. This is a multi-year project though and we are currently at 15% of coverage so to increase the amount of people involved we have created a video series and flowcharts to assist with the process as it can be quite complicated for new comers seeing as there are aspects that touch on relations, admin levels, geo-rectification and curating / improving existing data. For anyone curious, this information is in the OSM wiki. 4. Next year Ireland becomes the last country in the EU to roll out postcodes for the entire nation. What are the implications for mapping in Ireland? To be perfectly honest, I don’t know. There is a large information gap in this process and a lot of vested interests spreading FUD. A few of the things we know for sure are that it will cost money and will not be an open licence. In addition we know there will be a postcode for every household, so if you travel along a road which has a mix of houses and apartment blocks, each house will have its own postcode as will each apartment in each apartment block. This is going to make it very difficult to map these, but not impossible. Otherwise, the postcodes will simply be another source of geodata which we will look to collect where we can. 5. OSM recently celebrated it’s 10th birthday, where do you think the project will be in 10 years time, both globally and in Ireland specifically? I see OSM continuing to grow in every aspect, whether that be in terms of usage, quality or completeness. In terms of OSM globally, 3 things should allow for continued growth, one of which is easier collection of data through mobile use, which I mean is I should be able to open an app, add a feature and upload it to OSM within 30 seconds, any longer than that and data collection will only ever going to be a niche activity. The second thing I see pushing OSM forward are local chapters but there needs to be support from within OSM to kickstart these into growth. Even something as simple as during signup you place a marker on a map to indicate roughly where you are, well based on where that marker is placed, the next thing you should see is the option to (a) join the local mailing list, (b) sign up for the local facebook group, © join the local IRC chatroom or (d) a link to the local groups website. If none of these exist for the applicable area, then there should be option (e) a link to an OSM message board for that country. Things like this are important to allow mappers to have that first conversation of “how do I do X, Y or Z?”. Without this, too many people will sign up, get frustrated and leave, never to be seen again. This is something which should be doable and for not a lot of effort or expense. Lastly, and this will impact both OSM globally and OSM in Ireland, is Open Data, or the Open Government Partnership, or whatever its called in your local area. The release of key government datasets, so long as the licence is compatible, will hugely benefit OSM in many areas including, but not limited to, addressing, naming, classifications and overall completeness. Its an area I am active here in Ireland and because its in its infancy here, I have had plenty of chances to speak about the importance of the licence to avoid data being released, but not used, which benefits nobody. I would encourage everyone to get active in this area as there will be a benefit for all users of data and this is still only starting in many countries so it is possible to get in at the ground floor and drive it down the road of highest usability of the most valuable datasets. Many thanks Dave, and thanks to the entire OSM Ireland community. The next time I am sipping a Guinness I will toast your efforts! We agree with you a better, more local on-boarding process for new mappers would be a good way to encourage them to get active in the community and climb the learning curve.